It was quite long after my last post. Too much work and almost no free time. However, I've learned few interesting things, and I'm going to share them. And the first one - about the ESXi deployment. We have up to 20 ESX nodes in our offices worldwide. And sometimes it was a hard way to deploy them remotely, using local supporters help. Moreover, even in our datacenter in place where we're sitting, it's quite uncomfortable to provide some maintenance if you forgot to take warm closes. I knew there is a possibility to install ESXi on a USB flash drive. But I was interested in pre-deployment. The way is happened to be very easy. a) download the ESXi iso, for example here. Done! Now you have a fresh bootable flash drive with ESXi unconfigured yet. Next thing I did, is just connect it to some laptop (I had Lenovo G550) and boot up.You can use any PC or laptop with H/W Virtualization support. The only issue I had with this budget laptop using ESXi, is that the keyboard doesn't work. So I just have plugged an external one. Now, you can configure the network and make some configuration remotely, with vSphere client, that is not possible to do from the console. 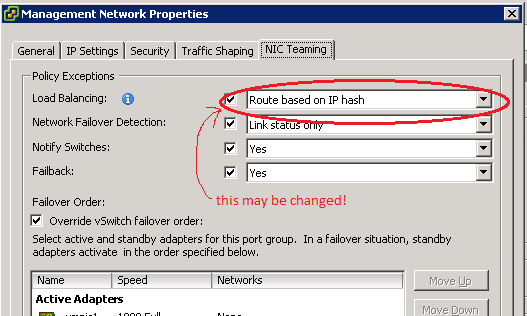 The main problem we had, is that after you select several interfaces to be used for NIC teaming (or portchannel on the Cisco switch side), ESXi that by default it uses "Route based on the originating virtual port ID". And that doesn't work well with the Cisco default configuration, which requires to be set the "Route based on IP hash" (or src-dst-ip hash). Important note, for those who faced that NIC teaming is not working correctly! In difference to ESX 4.0, which we had used before, in ESXi 4.1. we found, that it makes NIC teaming configuration of management interface not as a default (inherited from the virtual switch config), but configures it independently! This strange behavior cost us 2 hours before we found this. Because we checked many times the NIC Teaming configuration of vSwitch and had no idea that Management Network has it different. Next I configured all DNS settings, all VM and VMkernel networks, NTP, etc... Then I closed vSphere client and made the final network configuration to be used in the datacenter. Shutdown.... Ready! All I need after that, is just go to the server room (or send a flash drive to the remote office), plug flash drive to the server (In case of IBM x3650 M2 and M3 there is a special USB port an a RAID controller for that purpose), boot from USB (in case of the mentioned IBM servers - boot from HardDisk1), and select the network interfaces to be for the Management Network after ESXi boot. That is the way I do the ESXi deployment now. If you have any suggestions - you're welcome.